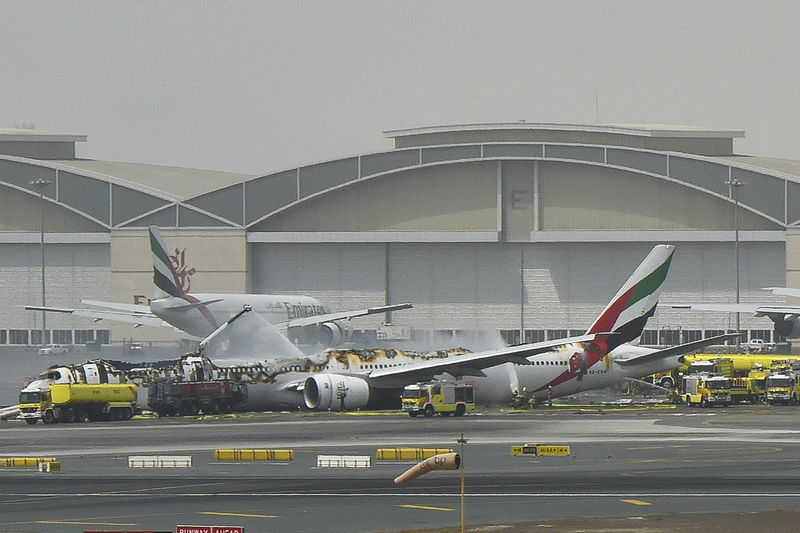 Emirates aircraft, EK521, flying from Thiruvananthapuram, India, to Dubai made an emergency landing at Dubai International Airport on Wednesday. Emirates confirmed that there were no fatalities among the passengers and crew. A firefighter was however confirmed to have died saving others. Shaikh Ahmad says he can confirm the aircraft was up to date with inspection checks. "As an operator it's our duty to apply all the rules when it comes to safety. "It was very much clear to land that day." Shaikh Ahmad says he can't comment at the moment on whether there were any issues with the landing gear. "I don't want to give you something which isn't 100% transparent," he says. "When i got the call I went to the site and to our emergency operations room. I was happy to see eveyrone in place. The minute we knew everybody walked away form the aircraft we were very much relieved. Shaikh Ahmad says the aircraft may have aborted its initial landing due to wind shear. Shaikh Ahmad says the pilots had 7,000 hours of flying time. Departures have resumed at Dubai International Airport following an emergency landing earlier Wednesday, Dubai Media Office confirmed at 6.43pm. The first flight to depart was a Gulf Air flight to Bahrain, and the second a Qatar Airways flight to to Doha, Dubai Airport said. Emirates aircraft, EK521, flying from Thiruvananthapuram, India, to Dubai made an emergency landing at Dubai International Airport on Wednesday, Dubai airport sources said. Emirates confirmed that there are no fatalities among the passengers and crew. A firefighter died while saving the lives of others, the General Civil Aviation Authority said (GCAA). "This Boing 777 flight was carrying 282 passengers with 18 crew members on board. We are grateful to God for his mercy and confirm that there were no fatalities among the passengers and crew on board," the GCAA said in a statement. "We are however, very sad to announce that one of the firefighters lost his life while saving the lives of the others. “On behalf of the General Civil Aviation Authority, I would like to offer my heartfelt condolences to the family of deceased. I salute his ultimate sacrifice that kept many from harm’s way. Our thoughts and prayers are with his family”, said the director general of GCAA. "Our investigators are working closely with Emirates Airlines and Dubai Airport to establish the cause of this accident however, our top priority at the moment is to ensure the wellbeing of the passengers, many of whom were taking flights to their onward journeys from Dubai and to assist the families of the passengers whose loved ones were on this flight." The firefighter has been identified as Jassim Al Bloushi, from Ras Al Khaimah. Dubai International Airport has been closed until further notice. Emirates passengers who bought tickets on or before August 3 will have rebooking, re-issue and cancellation charges waived, Dubai Media Office tweeted. In an official statement, Ali Salim Al Midfa, Chairman of the Sharjah Airport Authority, said: “A number of Emirates Airline flights were diverted to Sharjah International Airport and the airport is well prepared and equipped to handle extra arrivals to its daily quota. Shaikh Ahmad Bin Saeed Al Maktoum, president of Dubai Civil Aviation and chairman and chief executive of Emirates airlines and group, has commented on the accident involving flight EK521 in a video message posted to the Dubai Media Office Twitter account. In the video message, Shaikh Ahmad confirmed the accident had taken place and that there were no fatalities among the 300 passengers and crew onboard the Boeing 777 that caught fire after landing. “Our priority right now is the safety of our passengers and crew and communicating with their families and friends,” he said. Shaikh Ahmad confirmed Emirates is working with the authorities and emergency services and asked for the privacy of the airline’s passengers and crew to respected. “We will inform you of more details of the accident when we get it,” he said. Less than 10 passengers were treated for smoke inhalation and burn injuries at the Rashid Hospital after the Emirates airline accident. Only one person was admitted for long-term treatment. According to the official statement from the hospital, the Rashid Hospital Disaster Management team was put into high alert by 12.45 pm soon after news of the incident was reported. All 37 emergency beds, 88 critical care beds and 166 stable cases beds were ready. However these were not pressed into action. Due to the closure of Dubai International Airport (DXB), flydubai has cancelled all flights to and from DXB until 22:00 (Dubai time). Passengers are advised to contact their Travel Agent or the flydubai Contact Centre on (+971) 600 54 44 45 to rebook on the next available flydubai flight or receive a refund to original form of payment. The Emirates aircraft was a Boeing 777-300 and delivered in March 2003. Evacuation and rescue operations were done with extreme efficiency and care and passengers were taken to safety in no time. The Boeing 777 aircraft, departed at 10.19am from Trivandrum International Airport and was scheduled to land at 12.50pm at Dubai International Airport. We are expecting a 8-hour network wide delay, more information will be available on the Emirates website and social media channels. Emirates can confirm that today, 3 August 2016, flight EK521 travelling from Trivandrum International Airport in Thiruvananthapuram, India to Dubai has been involved in an accident at Dubai International Airport. There were 282 passengers and 18 crew on board. We can confirm that there are no fatalities among our passengers and crew. All passengers and crew are accounted for and safe. We are expecting a 4-hour network wide delay, more information will be available on the Emirates website and social media channels. All passengers have been escorted to safety. The area has been cordoned off. No takeoff and landing at Dubai airport right now. Emirates can confirm that today, 3rd August 2016, flight EK521 travelling from Trivandrum International Airport in Thiruvananthapuram, India to Dubai has been involved in an accident at Dubai International Airport. There were 275 passengers and crew on board. Our main priority at this time is the safety and wellbeing of all involved and full co-operation is being extended to the authorities and emergency services managing the situation. Anxious relatives are waiting to see the passengers on the affected plane at the waiting area of the arrival terminal. Reji George who lives in Deira is one of the relatives anxiously waiting for the passengers to come out at the arrival lounge. His brother and family were among the passengers. "I was on the way actually because the flight landed. They called me around 12:50 saying that the flight is burning and all the passengers are out. Nobody knows actually what happened." He said his brother, wife and two kids aged 10 and 12 were safe. Another Indian man who didn't want to be named said he was waiting for his wife. "People have inhaled smoke. Those who left the plane early might not have. But those who went out later have inhaled smoke," he said, quoting his wife. "All of them in the hanger. We don't know how long it will take for them to come out." "I went to the EK office on the 3rd floor to ask What is the next step the general procedures... they are not saying anything.. they asked me to ask at the information coubter at the arrival area I had already gone there." Manu, who came to pick his cousin sister and two kids, said he got to know the information on the way through flash news. "I spoke to her once. She couldn't say much. They are okay. But I think the kids have inhaled smoke. The second one is just three months old. She had gone to Kerala for her delivery." Here husband is in Abu Dhabi and he is on his way. He had planned to come only tomorrow because we are here. But now he is rushing here, said Manu who was seen consoling his brother-in-law.